We don’t know why Rodgersias are not grown more in gardens, but suspect that many do not know them. As a foliage plant for damp semi-shade they excel. This is an Ernst Pagels selection with stunning bronze leaves which have sharply serrated edges. These hold their colour through the early season becoming dark green by midsummer. The cream flushed, red flowers are held high above the foliage. You get good autumn colour too. A selection that is smaller than other species and is rarely offered. Hardiness rating H7. Pot size 1.5l. Cut the overwintered foliage off in late spring. Divide older crowns in spring. Easy but very rarely offered. Was delivered promptly and well packed. 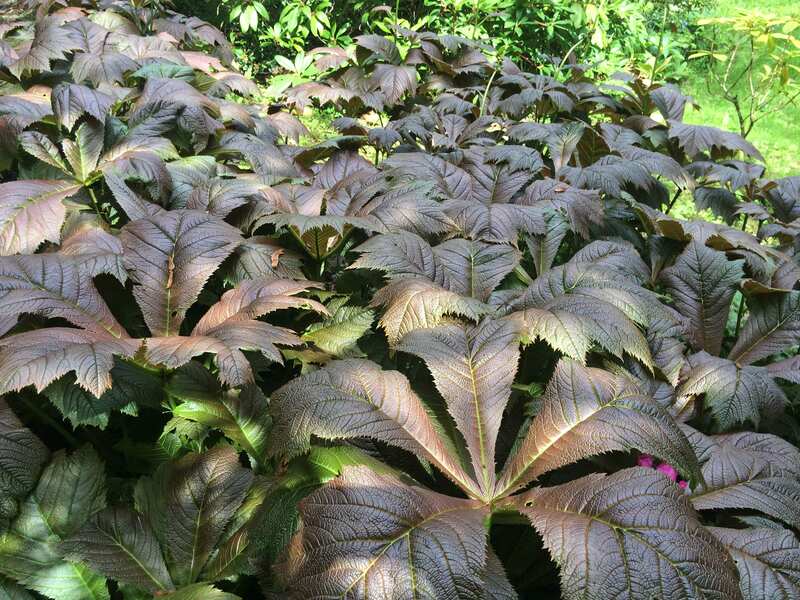 This is my favourite Rodgersia as it’s big bold and beautiful. Lovely upright growth and the foliage is a most spectacular wide and spreading palm like growth. It seems to like the position of dappled sun and moist soil and looks good so far. The delivery was quick and plants well packed. Order these plants before they grow too big or they may suffer in transit. The service and advice from Richard was first class too.